Despite their defensive success in 2018, there's no question the Cowboys could afford to add some talent across their defensive line this offseason. In particular, the Cowboys need some defensive tackle help, with Maliek Collins entering a contract year and David Irving remaining MIA. 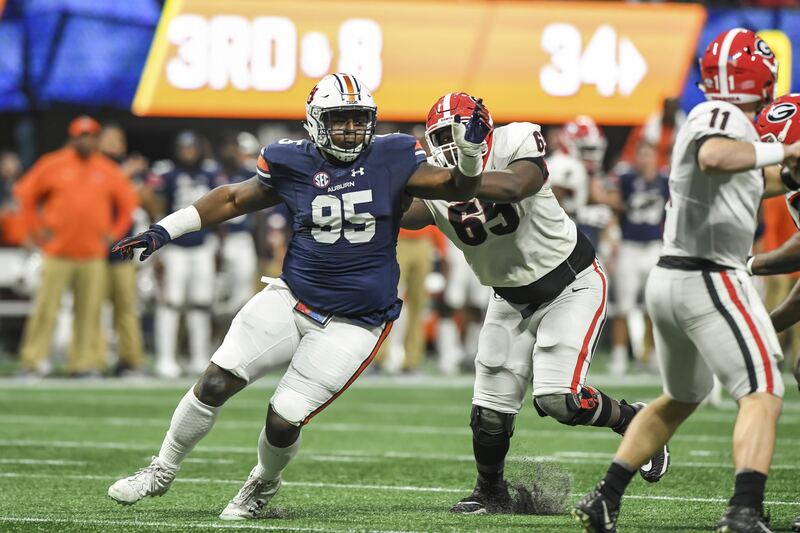 Our search for a run stuffing defensive tackle in this year's NFL Draft class begins with Auburn's Dontavius Russell. The 6'3" 320 pound tackle certainly looks the part of an interior run stopper, and his film shows one as well. In his senior season, Russell tallied 36 total tackles, 6 for loss, and 1.5 sacks in 13 games. While not eye popping numbers by any stretch, Russell's flashes on the defensive line are impressive. Playing with high effort every snap, Russell is a strong run defender who can anchor inside. He is rarely moved off the ball, and can stone double teams to free up linebackers behind him. His play strength is another key to his success, as he has to maximize that strength to overcome what he lacks in other areas. Here we see Dontavius Russell at his best. Lined up as a 2i technique, Russell stones the guard with a good first step and punch. He gets his hands inside of the guard and controls him, bench pressing him into the backfield. Then, when the quarterback is forced to choose a side, Russell sheds his blocker and makes the tackle at the line of scrimmage. He needs to improve his ability to get off blocks laterally and shed at the point of attack, but his strength and hands help him to make plays like this. Dontavius Russell is far from an explosive player, and lacks the burst in his first step that top tier defensive linemen have. He's often a tad slow off the ball, and relies more on his ability to play strong and clog running lanes. On this play we see Russell flash some explosiveness, however, as he will do from time to time. The 3-technique on the far side of the screen, Russell beats the offensive line off the ball with an excellent first step. The tackle tries to come down and wash Russell down the line of scrimmage, but his get-off is too quick on this rep. Still, these flashes of explosiveness are few and far between. Dontavius Russell is a load, playing with solid strength and good hands. He is not the type of tackle who will offer much in terms of style points often. Russell doesn't offer much as a pass rusher either. His best (and really only) move is his bull rush. Russell does a solid job of pushing the pocket from the inside with his bull rush, and keeps his hands active throughout his rush. Still, he is not flexible or twitchy enough to be a consistent pass rusher in the NFL. Most likely Russell will be relegated to a two-down player, used on run stopping downs and in short yardage situations. Russell is not a player with a ton of upside either. He kind of is who he is, a run stuffing defensive tackle who understands his responsibility and does a good job of executing it. The things is, for what the Cowboys need and where you can get Russell, that type of player is fine. Adding Dontavius Russell to their defensive unit as a rotational 1-technique would be a smart move, especially if they can snag him in the third round or beyond. If he can keep his pad level down, loosening up his hips and making him even more difficult to deal with inside, Russell could be a key addition to Rod Marinelli's defensive line rotation. The first-round of the 2019 NFL Draft has come and gone, but the Dallas Cowboys have yet to make a pick. The impatience many of us are dealing with right now will finally come to an end today when the Cowboys make the first of their two Day 2 selections at 58th overall in the second-round. The Dallas Cowboys are slotted to pick 26th in the second-round today, meaning there's still a lot that's going to happen between now and then before they can write a name down on their draft card. Instead of getting into specifics of who the Cowboys could select with the 58th overall pick, I'd rather focus on a player I believe they should draft at some point on Day 2 no matter what…Mecole Hardman. Drafting Hardman 58th overall is a bit of a reach for most people, but I don't think so if you take into consideration all of the ways he can help as a rookie. I don't believe the Cowboys will take him that early, but the 90th overall pick in the third-round is much more realistic. If I was in the draft room, I would absolutely pound the table for Hardman in the third if he still available. Mecole Hardman, the former Georgia product, is a dynamic playmaker in all three phases of the game. He can play receiver, special teams, and even as an emergency defensive back due to his background as a cornerback. That kind of versatility is invaluable, especially in the NFL where roster spots are priceless. Hardman was part of a deep skill group with the Bulldogs the past two years. Despite being one of the most dynamic playmakers on the team, he only accumulated 73 touches during that time span. He turned those touches into 13 touchdowns, 16 yards per reception, 7.5 yards per rushing attempt, and averaged over 20 yards per punt return. It's a small sample size, but the numbers speak for themselves. Mecole Hardman is the most dangerous player in space in the entire 2019 draft class in my opinion. His legitimate 4.33 speed certainly helps, but it's his flexibility, explosion, and balance that makes him extremely difficult to tackle in space and in close quarters. There are very few defenders, if any, who possess the kind of quickness and athleticism to corral him, which is why he can turn a simple play into a home run anytime he touches the ball. His speed and elusiveness when in space makes it extremely difficult for defensive players to get a good angle on him. You see time and time again how easily he glides past them, leaving them grasping for air. 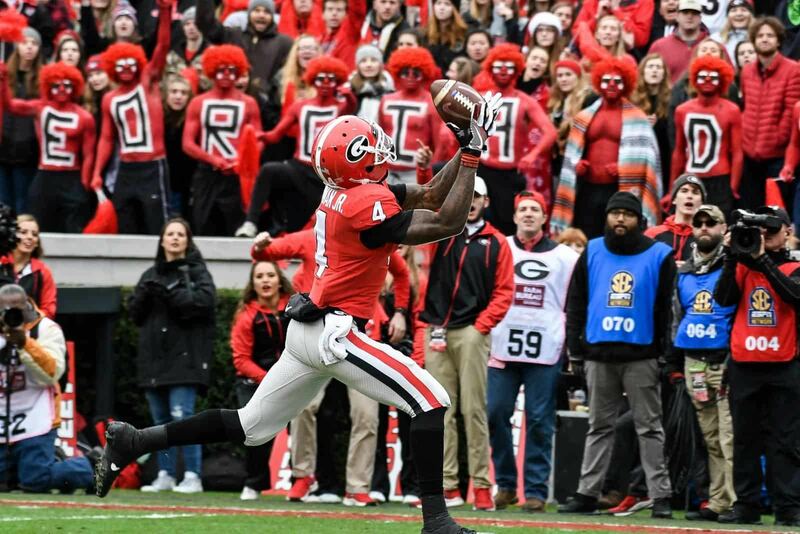 Anytime Georgia was able to get the ball in Mecole Hardman's hands good things happened. Surprisingly though, he wasn't used much on "gadget" plays, but it's part of his game that will definitely be utilized more at the next level. His speed and ability to capture the edge quickly really puts opposing defenses at a disadvantage whether it's on reverses, jet sweeps, or end-arounds. Again, Hardman's speed and ability to quickly capture the edge makes it nearly impossible for defenders to get a good angle on him. This is just a simple reverse, but as soon as Mecole gets the ball in his hands he's gone in the blink of an eye. Can you just imagine how effective that would be in the Cowboys offense because of the amount of respect Ezekiel Elliott commands in the running game down after down? Zeke gets the flow of the defense going one way and BOOM, there goes Hardman the opposite direction for six. The Dallas Cowboys could definitely use an upgrade in the return game, whether on kickoffs or punt returns. Yes, they have Tavon Austin, but he's only under a one-year contract and isn't guaranteed to even make the final 53-man roster. This is especially true if Mecole Hardman is added to the mix. He was one of the more dangerous return men in the nation at Georgia, averaging over 20 yards per punt return. In the play above, Hardman shows why he's so dangerous as a punt returner. He easily secures the catch and then explodes into the open field as if he was shot out of a cannon. That's when his natural instincts in space takes over. He has tremendous vision in the open field, seeing and hitting creases other players can only dream about. The vertical passing game is where Mecole Hardman separates himself from other wide receivers in the 2019 draft class in my opinion. The only other WR I believe may be a better deep threat is Emanuel Hall out of Missouri, but he's not nearly as versatile of a player as Hardman. Despite his limited use in the passing game at Georgia, Hardman seems to have a really good understanding of how to process coverages. He knows whether a safety, cornerback, or a linebacker is responsible for him in coverage, and knows how to take advantage of it. Getting Hardman matched up with a safety or linebacker is a matchup he's going to win 99% of the time, especially if he gets a free release off the line of scrimmage. Most cornerbacks have a hard enough time sticking with him when he goes vertical, which former Alabama CB Tony Brown found out the hard way. Tony Brown is a 4.35 speedster himself, and is fresh off a pretty solid rookie season for the Green Bay Packers. Hardman quickly eats up the cushion Brown gave him and easily wins over the top for a walk in touchdown. That kind of vertical threat from the slot WR position is something the Cowboys offense never had with Cole Beasley and certainly missed. I know a lot of people are going to disagree in the Dallas Cowboys taking any kind of offensive player with either of their two draft picks on the Day 2, let alone a receiver, but for me it's Mecole Hardman no matter what. I don't think there is another offensive player in the entire draft class, at any position, who can be as big of a difference maker with the Cowboys. The kind of skill set, versatility, and athletic ability Hardman possesses is rare and extremely difficult to come by. I think he's going to be a Tyreek Hill, Tyler Lockett, or DeSean Jackson type of offensive weapon in the NFL. He's just the kind of player you find ways to get the ball to and there's not a doubt in my mind he makes the Dallas Cowboys better from Day 1. That's why I'm pounding the table for him at 90th overall if he still on the board.